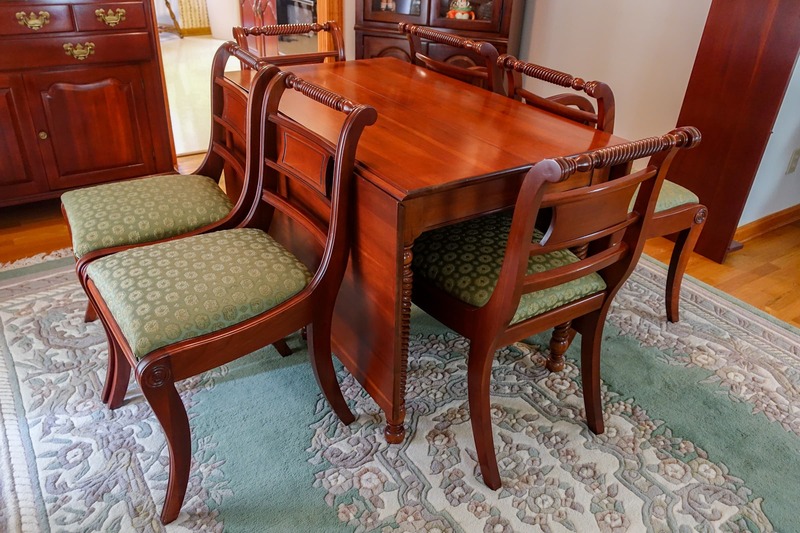 2-Day Walker Estate Auction — Harritt Group, Inc. Selling live onsite the lifetime collection of the late Charles & Helen Walker. Auction highlights include 1984 Chevrolet El Camino Conquista, Willett cherry furniture – dining and bedroom suites, victorian furniture, ornate mirrors, quilts, antiques, collectibles, cast iron doorstops, oak wall phone, glassware, china, lamps, Ray Harm prints, rugs, household, industrial cabinet with butcher block top, lawn equipment and tools. A variety of items will be offered each day. Auction located off Gagel Avenue just East of Dixie Highway. 1984 Chevrolet El Camino Conquista w/69K original miles. Rope twist poster & cannonball full size beds, 6 drawer chest, glove box dresser, night stand, Welsh style hutch and rope twist drop leaf dining table & chairs. Marble top plant stand, (3) walnut victorian marble top lamp tables, Chippendale style mahogany secretary bookcase desk, Victorian wash stand, marble top chest, organ stool, (2) ornate needlepoint french arm chairs, walnut dry sink, oak jelly cupboard, (2) Chippendale style loveseats from Statesville Chair Co., NC, curio cabinets, french provincial sofa, tables & server, oak 1920’s china cabinet, (4) rockers, iron ice cream chairs & tables, wicker settee, brass & marble plant stand, gateleg dining table, one-drawer stand table, ornate corner chair, (4) cherry bookcases, Lazy Boy loveseat recliner, green leather reclining sofa, Queen Anne entry table, small corner shelf, quilt rack, child’s rocker, recliner, tables, chairs & more. Selection of quilts, miniature hickory egg basket, hanging antique electrified kerosene lamp w/prisms, ornate brass kerosene piano lamp, Gone With The Wind hand painted kerosene lamp, (6) Ray Harm prints, coffee grinder, large selection of hand painted china dinnerware, vases, tankards, shaving mugs, stoneware churn, large selection of cut & pressed glassware, oak Kellogg wall phone, bisque piano babies, cast bull terrier doorstop, cast cookware, oak Statue of Liberty kitchen clock, 24” Royal Bruxonia Austria vase, set of Bavarian fish plates & platter, Flow Blue plates & bowls, ironstone, Northwood carnival pitcher & (7) tumblers, ornate beveled mirrors, wrought iron fireplace set, Don Ensor prints, linens, compote with frosted eagle lid, colorful stoneware pitcher, blue granite coffee & tea pots, brass RR lantern dated 1864 w/L&N globe, flax wheel, blue & white stoneware butter crock, salt crock & pitcher, oriental vase, art pottery umbrella stand, Bennington spittoon, ornate silverplate brides basket, R.S. Prussia chocolate set, Nippon vase, (10) Germany creamers, iron bulldog bank, Roseville ITP pitcher, paperweights, jars of marbles, Admiral Dewey pitcher, Bavaria Handarbeit china set, (10+) china pitchers, Kiss Me Gum jar, ornate iron french Waterbury clock, McCoy banana cookie jar, milk glass, clown juicer, cast vanity slag glass lamp, reproduction art glass lamp, silver plate flatware, vintage Singer sewing machine, wood Coca Cola case & much more. Metal multi-drawer tool chest w/butcher block top, vintage metal cabinets, tool boxes, Lawn Boy electric start and self propelled mower, older riding mower, gas power Billy Goat lawn vacuum and selection of yard, hand & power tools. (2) Ornate iron round tree benches, ornate iron chairs & patio table. C.W. Williams 17” deep seat saddle, cowgirl hats, assorted tack, Wahl animal clippers, dog crate & more. Assorted kitchenware, small appliances, linens, dehumidifier, 1970’s stereo console & many more common household items. I-264 to Shively Dixie Highway Exit. South to left on Gagel Avenue to left on Estate Drive. Right on Knight Road to right on Hedges to right on Glenrock.